Colleges and universities have been starved for state funding through the ongoing budget impasse. 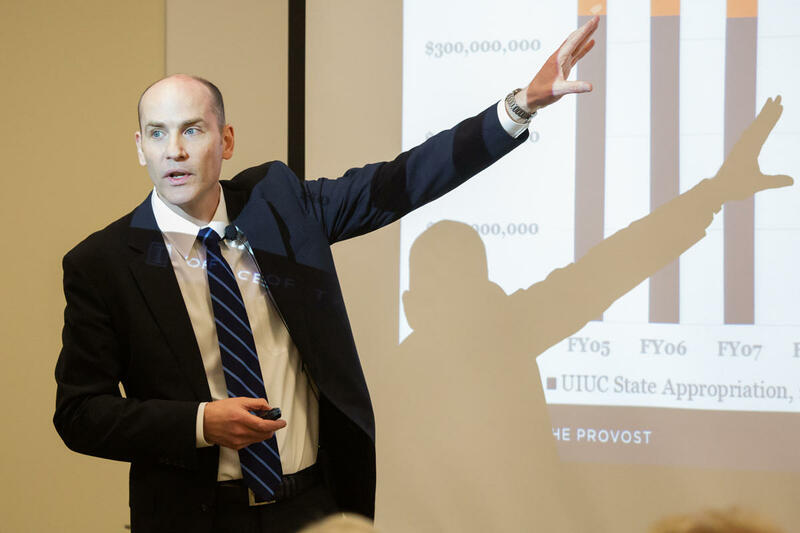 The interim provost at the flagship campus of the University of Illinois recently presented faculty and staff with a blunt accounting of the school’s financial situation. As one of the top administrators at the U of I, Edward Feser's academic specialty is in regional economics. In short, he’s a numbers guy. So when he decided to give the campus community an update on the school’s response to the budget problems, his talk included a big dose of digits. But that’s not all there is to it. Hear the whole story here. “We wanted to explain how we were dealing with the state funding shortfall. So from fiscal '16, from the stop-gap allocation that was provided, if we account for the amount of money that was directed to the university, and we also account for the permanent spending reductions that we implemented of $49 million annually -- after you account for those two things, in fiscal '16, we remain $140 million short. If we look at fiscal '17, we applied additional spending reductions of about $18 million. And then if we take account of the second round of stop-gap funding that was provided, we’re in the hole for fiscal '17 by $50 million. On putting these cuts into context:“These are unprecedented reductions. 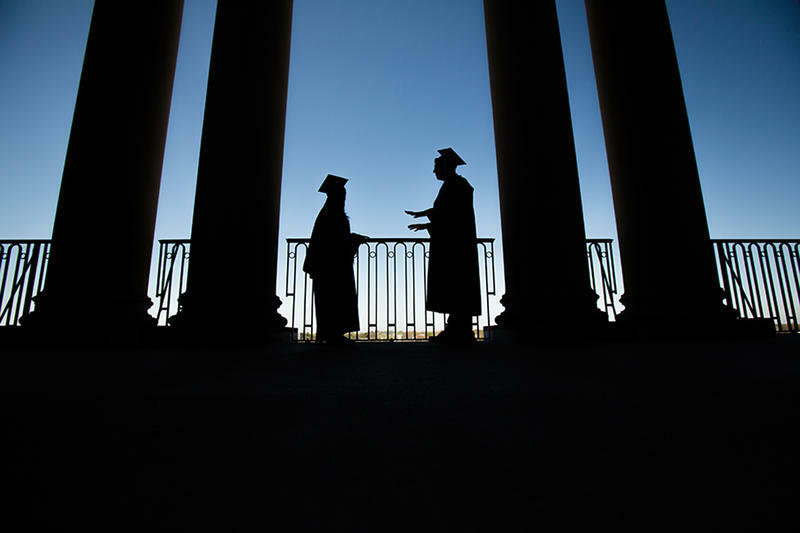 You don’t simply cut your higher ed by 50 percent one year, or 60 percent in one year. I mean, this is not normal. People are talking about states across the country which are reducing their spending on higher ed because other spending is crowding out that spending. But no states have failed to pass fiscal year budgets and then resorted to stop-gaps that have led to this magnitude of reductions for public higher ed on such a short time-frame.” On UIUC's plan for response to the budget crisis:“In my view and in most faculty’s view and most dean’s view, we don’t have an adequate approach to how we budget resources across the campus. The budgeting model was based on different economic circumstances, and we’re putting a lot of energy right now into an effort to completely re-tool that process. That’s an enormous exercise which will take us 12 or 18 months to get done, but I think it will put the university on a sounder footing. Essentially you can think of it boiling down to making sure that the way in which you’re accounting for what you’re doing, sharing information about what you’re doing and making allocation decisions -- aligning those things more directly with your academic strategy. “Well, we saw much more significant numbers of departures this year. We were very aggressive in trying to retain our best faculty, but we are seeing increasing numbers of faculty being recruited by other universities. We have heard anecdotal evidence of some states targeting Illinois for top faculty because of the budget impasse, and you know, it’s not as simple as saying, 'Well, I could earn more if I go to Texas or I could earn more if I go to California or Michigan.' I think for most faculty, it’s a question of whether the university is on a sound trajectory and can remain strong in the conditions in which it operates. 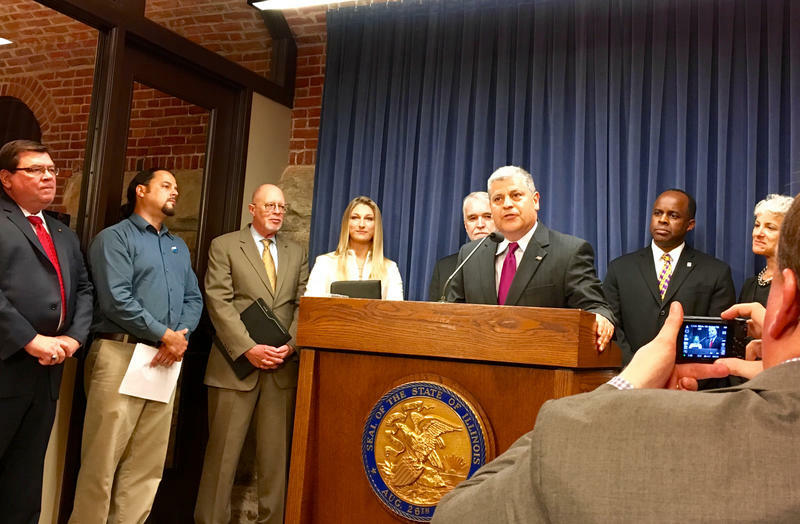 And so I think foremost in many faculty’s minds is the state of Illinois’ economy and Illinois’ politics, and whether they feel this is a place that continue to be supportive of higher education. That’s probably the biggest issue we’ve been trying to deal with in faculty retention. "But we have seen larger numbers of faculty leave this year. We’re very concerned about the coming year because it’s one thing to have one year of no budget; it’s another to go into a second year and then we really don’t have a clear sense of how things will resolve themselves after the election. We could be going into multiple years with stop-gap budgets, we’re told. We’re not standing still. We are dealing with a lot of headwind, but we are making investments. “Well, certainly the public perception is important, but it’s also important to realize that Barbara Wilson wasn’t a new position. She was a replacement position. She replaced Christophe Pierre. We have a university system, and the system has a vice-president for academic affairs, and Barbara took that position. As that was covered, it seemed to give the impression that that was a new position. It wasn’t a new position; it was re-structured to provide additional responsibilities. One of the things that Barb will have a greater influence over is the alignment of the academic mission at the system level with the resource question, the budget question. And before, that was not clarified in that position…. “You’re right, it has been a challenge to figure out how to navigate the political dialog. I have had politicians say to me, ‘Well, you know, probably nothing will happen until we see “more blood on the floor,” which apparently means more layoffs and pain. Because until that happens, apparently some are not motivated to regard the challenge as particularly severe…. “We have endowment earnings that have not been spent. 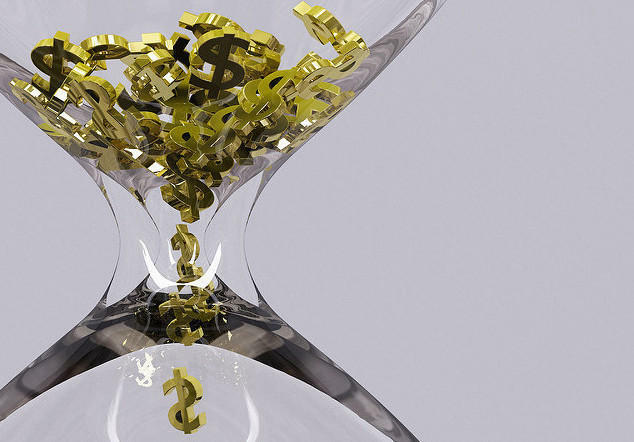 These are not a recurring source of funds… the amount that has accumulated is essentially a cash balance. And one of the reasons that happens is that many of the gifts that people give are tied to various things…. I was dealing with one a couple of weeks ago where it was a gift for an endowed professorship, but it only covers the discretionary funds for the professor; it doesn’t cover the base salary. So if you don’t have the base salary, which you often don’t in the current budget climate, you can’t spend the discretionary funds…. 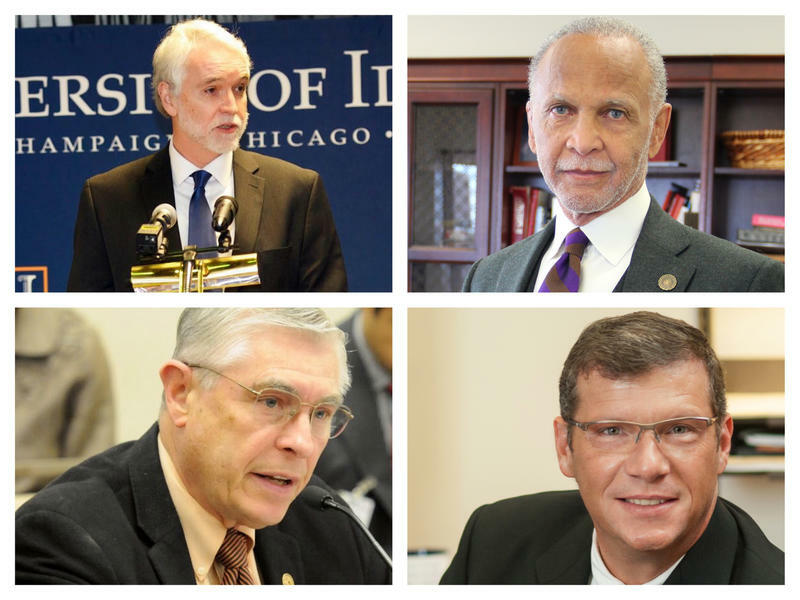 Illinois has not funded its colleges or universities for the past five months. It's easy to overlook that fact, because professors have continued to teach, athletes have continued to compete, and students have continued to learn. But around the state, college administrators are saying they've burned through their financial reserves.